I've first heard of the Hmong tribe when I read the beginning chapters of Elizabeth Gilbert's Committed (sequel to Eat Pray Love).If you haven't read it yet, this is the book where Gilbert faces her fears about getting married (again) by traveling in Asia and asking people about their views on marriage. 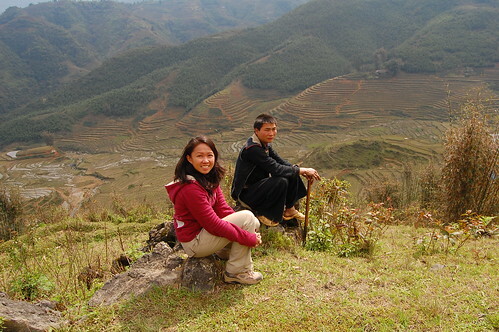 So she travels to northern Vietnam to visit a Hmong household. She asked the women questions like: “When did you realize that your husband might be somebody you wanted to marry?” Finally when Gilbert asks, “But when did you fall in love with him?” and “What do you believe is the secret to a happy marriage?” the roomful of Hmong women broke out laughing. It was as though she asked them to purchase some calcium supplements! They found her questions downright silly. Gilbert then concluded that the Hmong women do not place their marriages in the center of their emotional lives as do women in the West. As I read this book, I vowed to travel to Vietnam and meet these Hmong people myself. They seemed like such an extraordinary bunch! I would later find out that they were much more than that. They were one of the most beautiful tribe I've ever laid eyes on! I finally had my chance after our Halong Bay adventure. 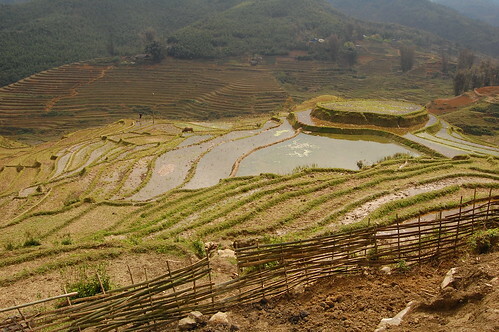 Last stop in Vietnam : the rice terraces of Sapa! 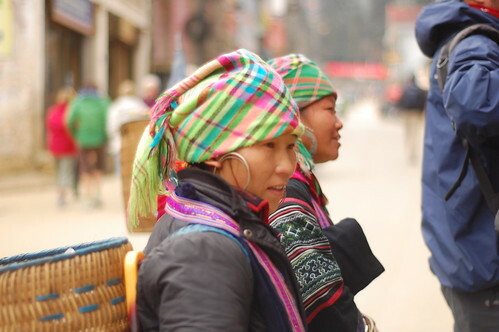 My first encounter with a Hmong girl was at the town square where the Hmong women were selling clothes, jewelry and souvenirs. I went in a photo frenzy. They were so colorful, beautiful and just plain photogenic! I absolutely forgot the number one rule of travel portrait photography: Ask Permission. I couldn't argue with her logic. She was relentless so I got her into conversation. She was only 16 years old and already had a baby. 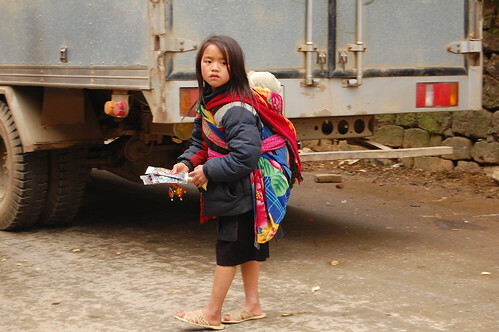 I couldn't imagine what a huge responsibility that would be for a girl her age. I eventually got her to pose for me. 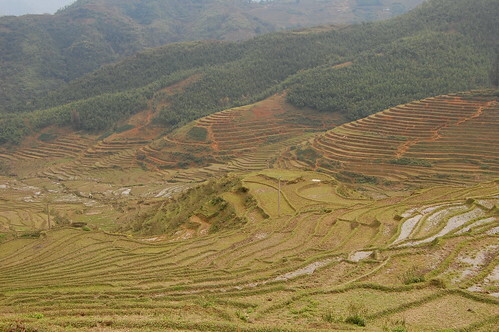 The rice terraces are the main attraction of Sapa. 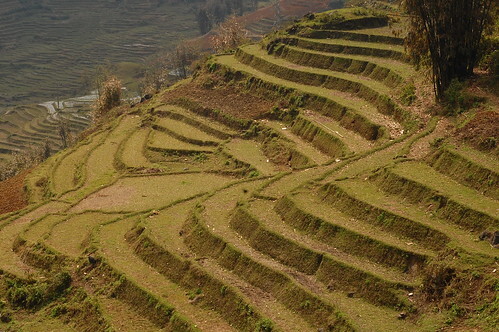 Unfortunately, joining a trek would cost us at least $30/day. An amount that was a bit more than what our backpacker's budget would allow. So we decided on a DIY trek. Starting out was pretty easy. We followed a well worn path down the slopes. But after a while, the path got muddy and steep and it got harder and harder for us to walk our way down. 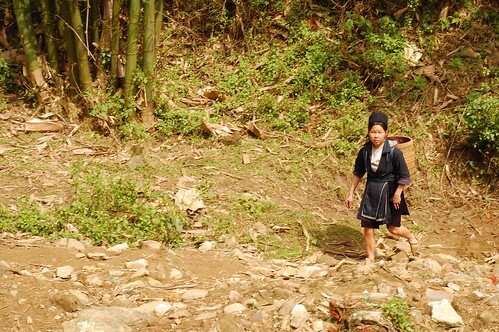 A nearby Hmong farmer saw our predicament and smiled at us shyly. He then walked down and showed us the way. He spoke no English but his hand gestures clearly asked us to follow him. He walked with us the whole way and even guided us back to town after the trek. We couldn't imagine how he hiked through the muddy terraces in rubber slippers but he was smiling the entire time. His act of kindness just validated what I already knew about the Hmong tribe: that they are a warm and exceptionally friendly people. I have to confess though, I didn't really finish the book Committed. It lacked the excitement and wonder of Eat Pray Love. I was bored out of my mind when she got to the part about the history of marriage. I felt like I was back in college with a stack of books for 'required reading'. But something great came out of those first few chapters for me. 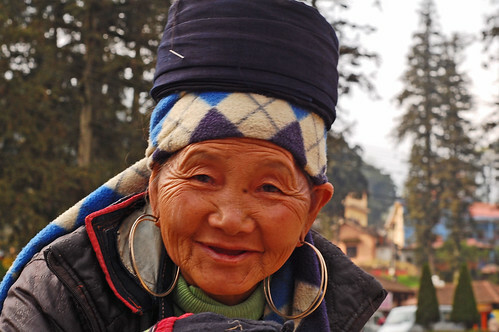 I came to Sapa, Vietnam to encounter a beautiful town and experience its enchanting people. Have you ever been inspired by a book to travel to another country? What books have fueled your wanderlust? Leave us a comment! 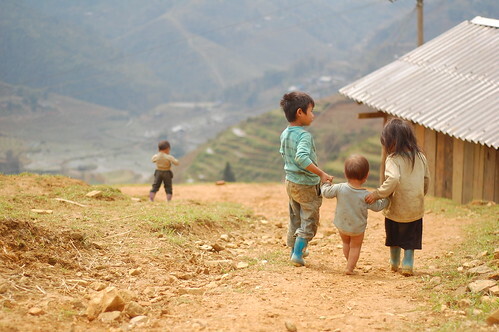 I LOVED Sapa! It's such a beautiful place and the people are so friendly. 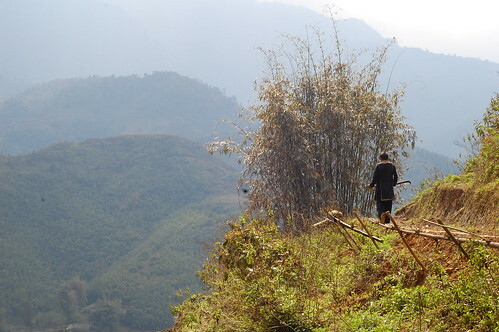 We didn't want to pay for a tour either, so instead, we paid one of the Hmong women in town to take us to her village. It was such an adventure and we had an amazing time with her. I'm glad you enjoyed it as much as I did. I totally agree with you Laura. I thought Hoi An would be the best place on our visit to Vietnam. 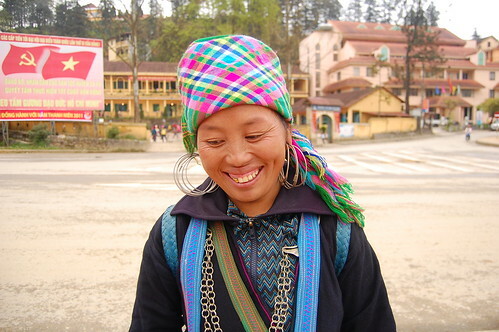 But Sapa had the most beautiful and friendliest people. I'm glad to we didn't skip it. Having a local as a guide is such a wonderful experience. And it was great since we didn't expect him to accompany us. The food here was amazing too! are you stil in vietnam? Not anymore Flip! I was thinking the same thing when I saw your Hanoi post. We are now in Cambodia but leaving for Thailand in a few days. We'll be there for a month. Any chance we'll run into you by then? I know what you mean Claire. How you can you just choose one book? When there are so many? But I'm looking forward to your selection. Thanks for the compliment on the photos. They were so beautiful and all I had to do was point and shoot! Don't be envious James. I'm sure you'll get to do that too in the near future. It's just a matter of time ;-) Hope we can join you in one of your adventures! 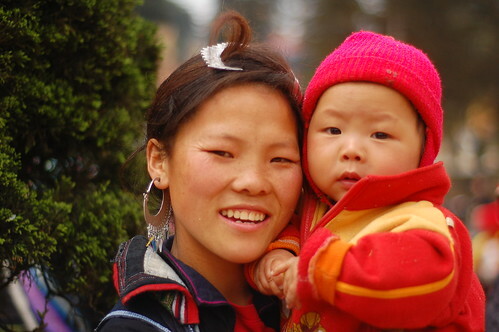 Seeing the Hmong people was a highlight for me on my trip through Southeast Asia too. They live such a different life from the one I am used to so it was fascinating to visit them. I didn't know that Elizabeth Gilbert wrote about them in her book. They truly are fascinating especially the way they think of themselves as part of a whole instead of individuals. Can't help but admire their sense of community!